The ThinkHealth Practice Management “EHR” process was started in 2013 to better serve our members and to move forward as a company. 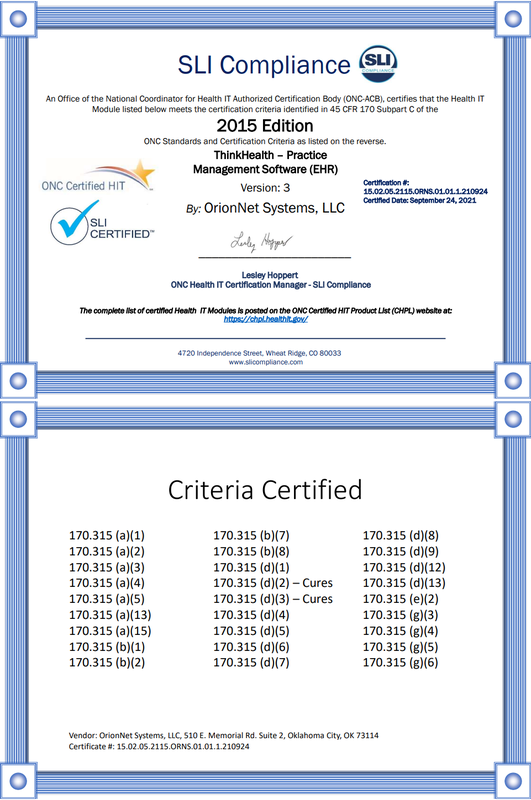 OrionNet Systems realized the benefit that being EHR certified would bring to our members, including increasing their revenue through grants from RFPs and increasing the quality of care of their clients. Our competitors said this could not be done but this continues as our promise to our members to keep advancing as a company. In order to utilize ThinkHealth EHR an additional fee of 20% will be added to our base cost. In order to meet Meaningful use you must utilize our ePrescription and DIRECT messaging modules which have additional cost associated with them. ePrescriptions will include an additional monthly cost for every user that will be sending prescriptions through the system. Systems that do not utilize ePrescriptions will not be able to send ePrescriptions electronically to a pharmacy. DIRECT messaging will include an additional monthly cost for every DIRECT mailbox that an agency will use. Systems that do not utilize DIRECT messaging will be unable to message things like a client's Clinical Summary to other EHR vendors. Contact us to find out more. There are no known limitations that a user may encounter in the course of implementing and using this EHR Module’s capabilities, whether to meet meaningful use objectives and measures or to achieve any other use within the scope of the health IT's certification. The additional software relied upon to comply with one or more of the certification criteria include: Microsoft SQL Server and EMR Direct. This sofware is included and pre-installed for our data host customers.